A few months ago, I was sitting on the couch in my library, writing email copy or a blog post. I saw a notification of an email from Mike Dooley, “the Universe guy,” about a training in New Orleans. Now, I’ve been a fan of Mike Dooley’s for a very long time. I’ve subscribed to his Notes From The Universe for probably ten years. I give away the small book versions as gifts quite often. I even had an opportunity to see him speak live once and it was an amazing experience. I clicked to read the email and I did something I almost never do. I decided within moments to submit a registration for this event. I didn’t think about it much or try to talk myself out of it or into it. I felt the excitement grow as I read through the description and then automatically started typing and CLICK! I knew it was meant for me, right here in the area near where I live – right now as I am shaping this business into exactly what I want it to be. As the days approached for me to leave, I did start to think, “Wow. What if this isn’t all you want it to be? What made you just say yes so fast? You didn’t even really think this through! !” I started to worry about parking, whether to uber back and forth, what to wear. What if I became anxious and introverted Laurie resisted interacting with others? And then it began. This wasn’t a training based on his material and created/delivered by someone else. This was a hands-on experience led by Mike Dooley himself. There were previously certified trainers who genuinely showed up just to inspire us and cheer us on. They played the same music I play on my morning playlist. They laughed and danced and cheered and motivated and shared deeply personal stories of their own journey to creating the life they want to live. It was joyful. I realized that these are my people. I was in a large meeting room surrounded by people I’d never met who were suddenly not strangers at all. They were instantly a part of my tribe. So day two, Frances says “Hey! 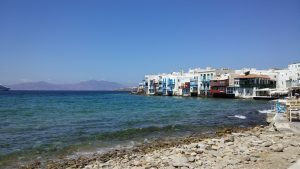 What if we did a retreat together on Mykonos Island? Or Maui? We can combine it with yoga and mindfulness practice!” Yes! Absolutely Yes! Which isn’t surprising since the training is based on his best-selling book, Infinite Possibilities: The Art of Living Your Dreams. So stay tuned, my faithful adventurers. We’re going to do great things together. And we might just be doing them while enjoying a stunning view.